Ever need a timer that provides multiple alarms ? A student that I work with is working on determining his self regulation needs along with completing homework tasks with greater independence using schedules and work choices within his day. Taking a walk for just a few minutes helps him self regulate and refocus on his work tasks. The walk time is only 4-5 minutes but knowing how far to walk in one direction and then returning back within the 4-5 minute period is another component that needed to be worked on to achieve the goal (yes, we have set the time on 2 minutes then when it goes off it is time to return, but then it is not a concrete, written cue!). Timers with Elapsed: The Multiple Timer App (iPad/iPhone) is one solution that would work providing an alarm with two presets for 2 minutes on his iPad mini. This app allows setting multiple alarms, unlimited presets, allows reusing the set times and stopping it and runs in the background. Seven different alarm sounds are provided in the free version plus Silent (vibrate) for iPhone. More alarms are available with an in-app purchase (1.99). 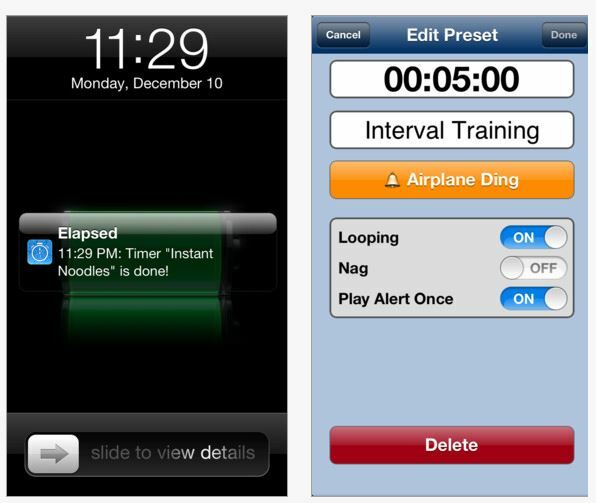 The alarms can be set for Looping, Nag or Play Alert Once providing persistent alarm reminders. Preset alarms can be searched alphabetically or according to Recent or Frequent for reuse. The free app does have an ad at the bottom of the screen which can be removed with the premium purchase. Although this is not the strict visual time with visible lapsing timer, Timer with Elapsed app definitely can provide support for students or individuals with cognitive impairments (CD, ASD, EF , etc. ) to support awareness of temporal organization such as multiple sequenced tasks, break periods and allotment of time at school, home or work. I know this would be helpful to me to help organize multiple tasks required to complete within a specific time period. 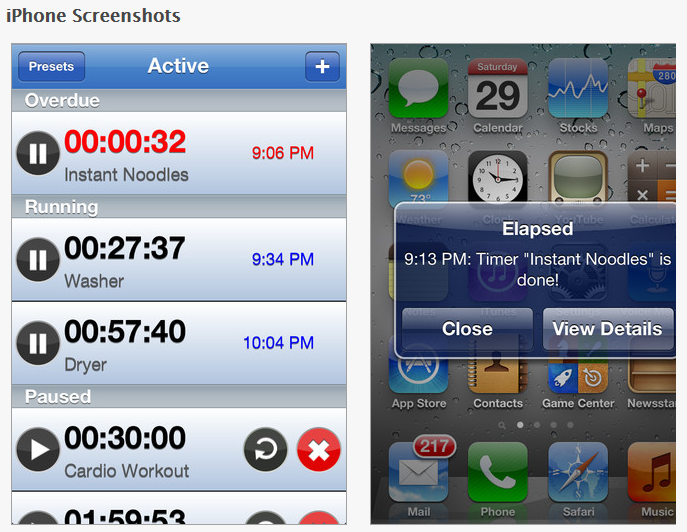 Have you used this app or any similar to this multiple timer app? This entry was posted in Adults, Adults with LD, App Rubric, Apps for OT's, Apps for Special Needs, Autism, Cognitive Impairment, Developmental Delay, Free apps, iPad, iPhone, iPod, Life Skills, Occupational Therapy, Organization and tagged App Review, Autism, Employment apps, occupational therapy, Organization, OT Apps, special education. Bookmark the permalink. Thanks for this post. I’ve had a couple of friends asking me about this kind of thing recently, so I’ve shared the post in my Facebook group. Thank you Sarah for your visit and your comment! Always good to hear from you!